Moonstone is a variety of feldspar that displays an amazing optical phenomenon called, adularescence. Internally repeating feldspar layers scatter the light that enters the stone creating a mystical white glow reminiscent of moonbeams. This glow comes to life, rolling across the gems surface, when it is moved. Traditionally, adularescent orthoclase gems have been called moonstone, however, other varieties of feldspar also exhibit this magical effect, including labradorite. RI, biaxial interference figure in polariscope and magnification. Fluorescence and SG might also be useful. Moonstone can also be labradorite feldspar. 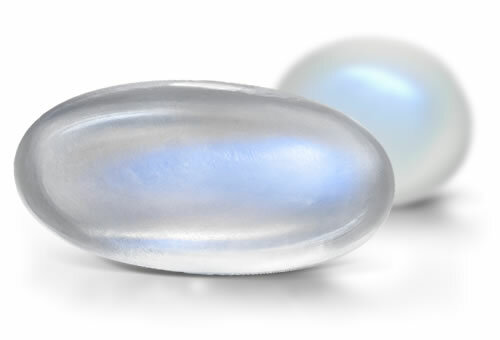 Moonstone will have blue or white adularescence. Stones might have centipede like inclusions and material with aventuresence or asterism might contain reflective inclusions such as fine needles or elongated hematite platelets.